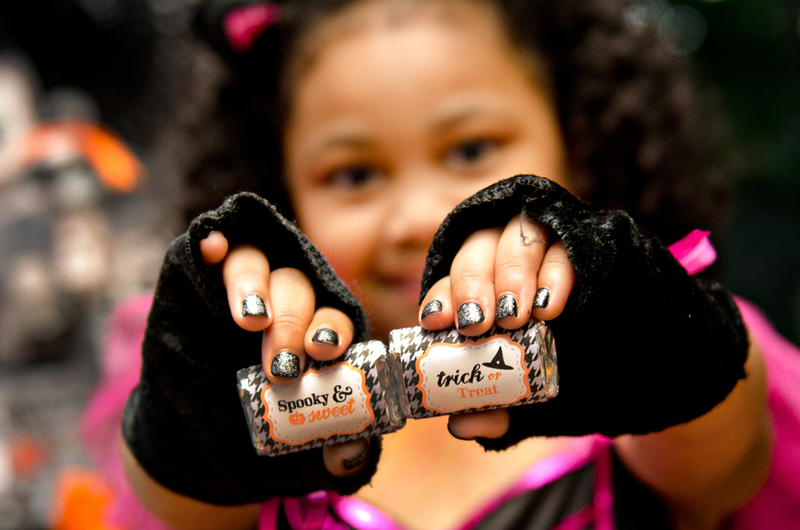 We're less than a week away from one of the most fun holidays for kids - HALLOWEEN! And, what's the most important thing about Halloween? The yummy treats, of course! 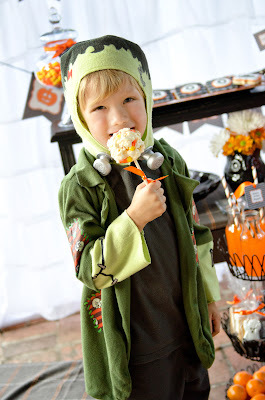 If you're looking for one special Halloween recipe to make for your family or ideas for an entire Halloween party menu, I've got lots of super easy ideas from this Halloween party I threw for some of my little friends. These just make me smile! 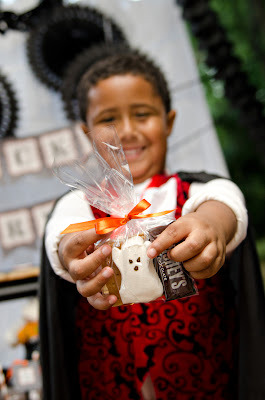 Break a graham cracker in half, and slide it in a clear treat bag with Ghost Peeps and a couple mini Hershey's Chocolate Bars. 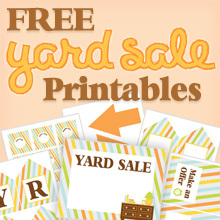 If you want to jazz it up even further, add tag from my Halloween Printable Collection. If you want to eat them warm, you can pop them in a microwave for 10-second intervals. Of course, I found the kids had a great time just eating all the parts individually. 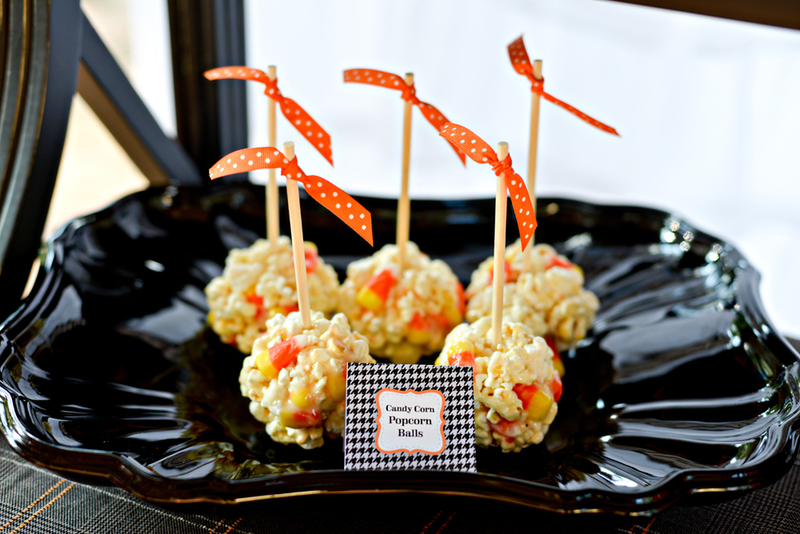 Candy Corn Popcorn Balls are a tradition at our house. Year after year, I get special requests for these, so you know they're good! This recipe from Cooking Light is super easy and, if you can believe it, LOW CAL! (Just 212 calories each...okay, not super low cal, but pretty good for a homemade dessert.) I added a little extra cute to them this year by pushing in a wooden candy apple stick and tying a little ribbon to the top of the stick. 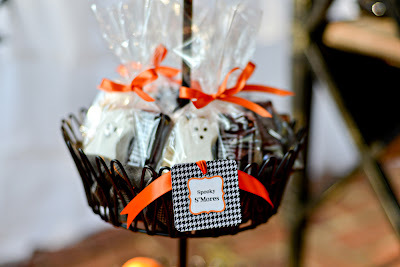 I also slid some into clear treat bags and tied them shut with twine around the base of the stick for some cute take-home party favors. To complete the look of this platter, I added a tent card from my Halloween Printable Collection. This is one of the pre-formatted menu labels, but you can also type right in the PDF to create your own custom food tags and treat label tent cards. As busy moms and working gals, we can't do it all, but we can come pretty close. That's why I love taking store-bought treats and adding a little of my own flair. 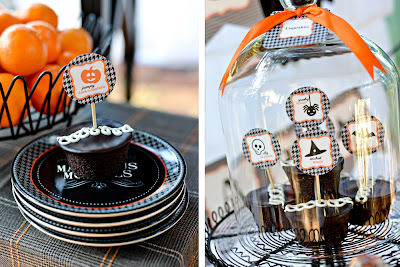 These Little Debbie Chocolate Cupcakes are perfect for Halloween with their deep black chocolate color and swirly white frosting detail. I auditioned the more famous brand of these cupcakes, but they didn't win the taste test...there was a clear difference. To make these even cuter, I just added Halloween Cupcake Toppers from my Halloween Printable Collection and tied a little "Cupcakes" tag onto my glass dome. Easy, quick, and done! Sometimes, an easy name change is all it takes to go from ordinary to extraordinary. 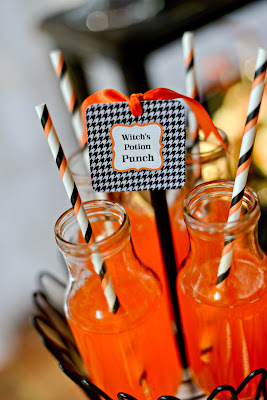 Take some orange soda, call it "Witch's Potion Punch", and voila! You could use sugar-free Kool-Aid, too, if you wanted to reduce some of the sugar intake at your party. To make my soda look even more fun, I poured it into some recycled Target latte bottles and added Halloween paper straws from Hey Yo Yo. 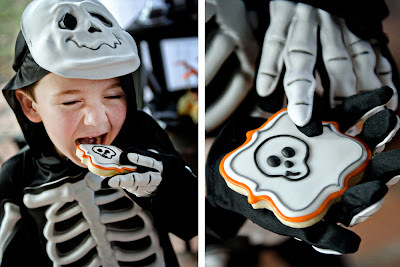 Halloween can be sweets overload, so it's good to have a little salty on hand, too. Going with an easy, store-bought approach + name change again, I created Monster Mix by pouring Chex Mix into adorable orange candy cups from Hey Yo Yo. The tent-card label is from (you guessed it! 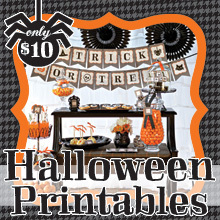 ), my Halloween Printables Collection. 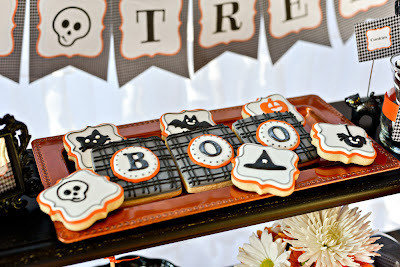 I also saw a fun Halloween recipe on Pinterest by In Katrina's Kitchen that would be fun to use, as well. At any party, it's really nice to have one special sweet. Lindsey at Tickled Pink Cookie Boutique definitely knows how to make a party special. Her cookies are so gorgeous in person with a light shimmery lustre...absolutely stunning and super delicious with a hint of almond extract. Bewitching! I love how she was able to perfectly match the designs in my Halloween Printables Collection. Of course, she can match any party theme, so be sure to like or bookmark her Facebook page. She ships, too! Details, details, details! 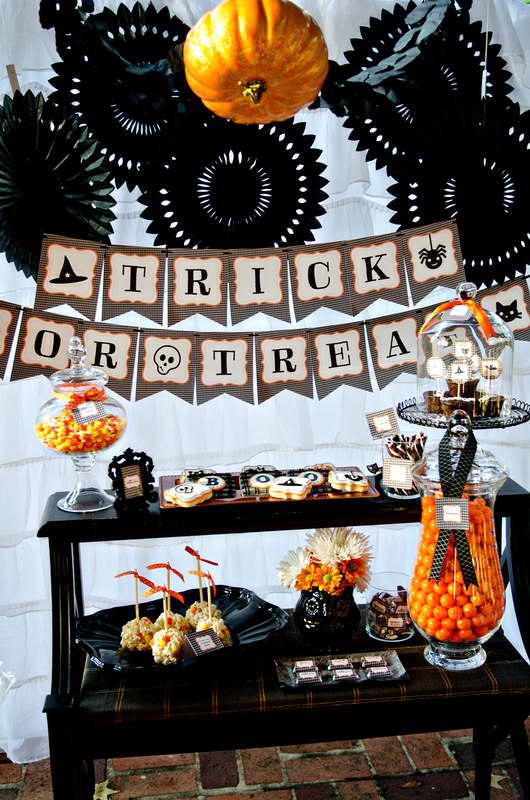 Here's another easy trick for personalizing your Halloween Party. 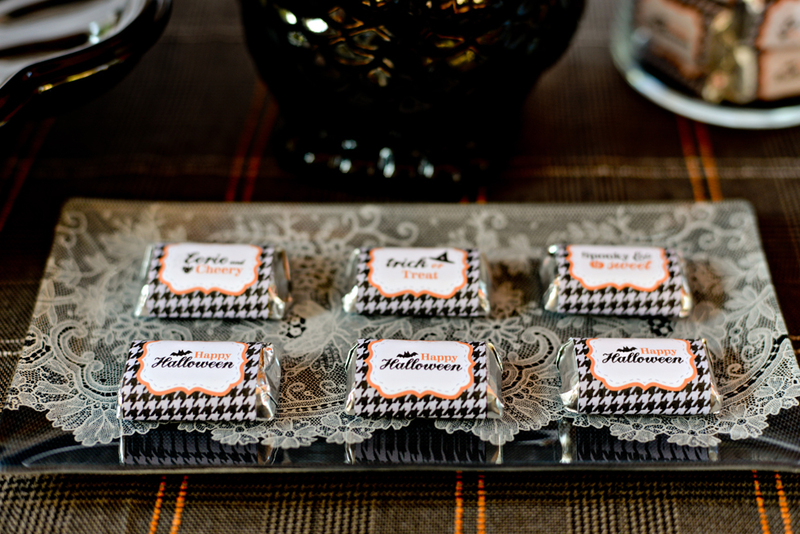 Wrap Hershey's Miniatures in festive orange and black paper (3 x 1.5" strips work well). 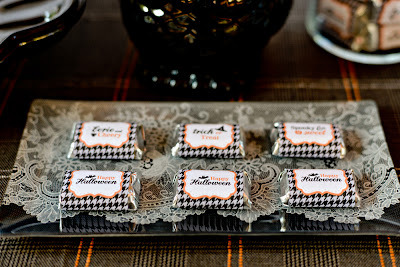 Or better yet, use the Halloween Mini Candy Bar Wrappers that come in my Halloween Printable Collection. Looking for a healthy Halloween snack? Load up on some Cutie Clementines. These are the perfect shade of orange for Halloween, are easy to peel, and oh so delicious! Don't they look super cute all piled up in the bottom of this basket stand?! And, finally, what Halloween Party would be complete without candy?! 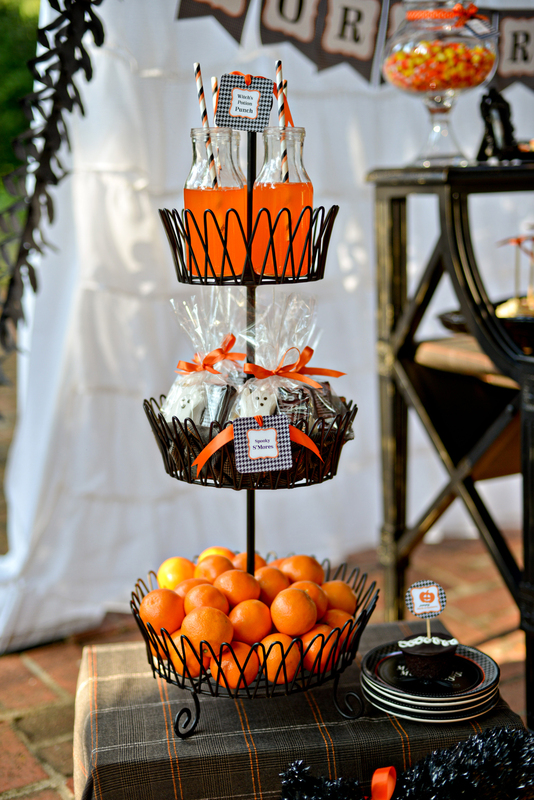 I love to make a bold visual impression, and this big jar of orange gumballs from Party City does just that. 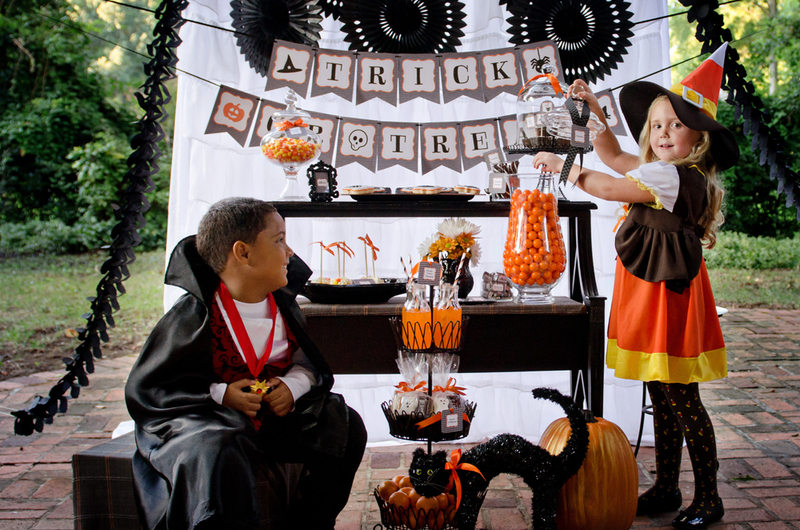 To save money when filling big candy jars like this, I always stack clear plastic cups upside down inside the jar to make a hallow center. Every little bit counts! I also used some of Party City's black-and-white striped candy sticks that have a great grape flavor that won't stain your mouth all up. 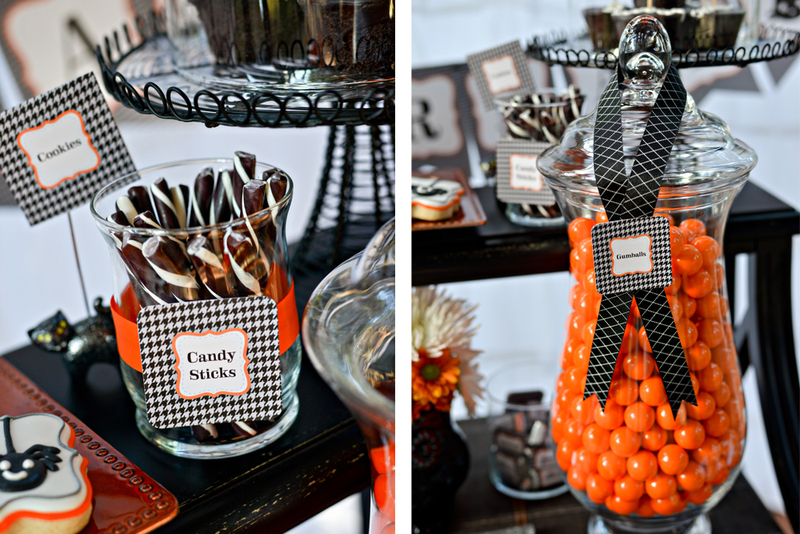 Since I love candy corn, a jar of this is a must for me, too! 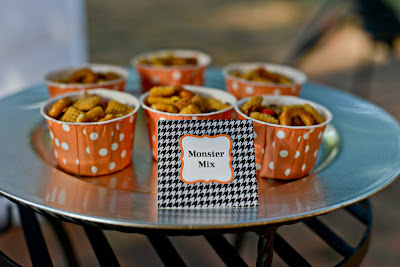 All of the amazing photos in this post were captured by Click Photo Designs by Sarah Brewer, a fantastic event and family photographer in Huntsville, AL. All the popular brand name drinks for unbelievable low price tags.